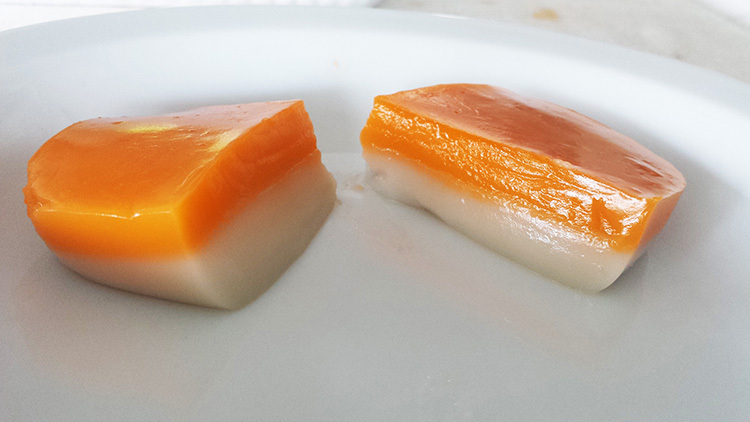 Lapiz is one of the favorites among Surinamese desserts. It is a fresh and cool sweet dish. Place the lemongrass and water together in a pan on low-medium heat for 15 minutes. In a separate large saucepan sieve the cornstarch and mix with sugar and salt. Mix the coconut milk and lemongrass-water in a bowl. Slowly add the liquid to the dry ingredients while whisking. Place the saucepan on a medium heat and keep stirring gently from the bottom for 30 minutes until the mixture thickens. Let the mixture simmer for a further 10 minutes on a low heat until the mixture starts to look glassy. Pour half of the mixture in a 25 cm x 25 cm glass dish. Add the food coloring to the other half and mix well, then slowly pour the mixture in to the same glass dish, on top of the first half. Place Lapiz in the refrigerator for a minimum of 30 minutes and allow to set before serving.